Have you drank the Golden Milk yet? Well, it is a drink containing coconut milk, or a different nut milk, turmeric, ginger, and sometimes honey or dates. Turmeric is becoming well known for its anti-inflammatory properties. It is also an antioxidant powerhouse and is showing promise in the possible prevention of certain cancers. Athletes can ease muscle soreness and improve recovery time by including it in their supplement regime. 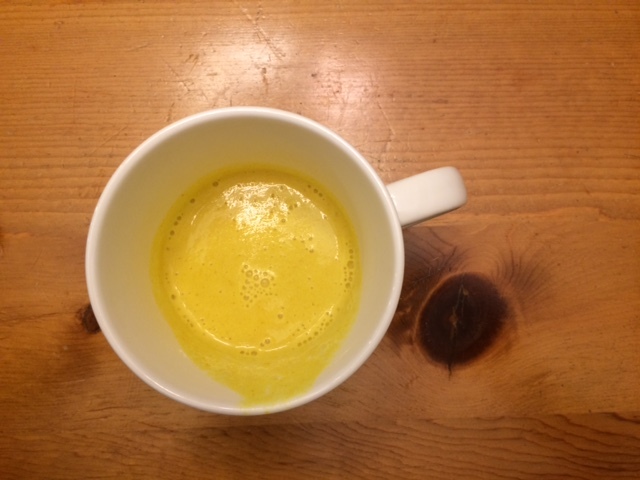 In addition to these benefits, ancient cultures have long used it in “golden milk” as an agent to boost the immune system and fight the common cold, the flu, and sore throats. It is an excellent health tonic to drink, especially as we creep into the cooler weather. 1 cup of the milk of your choice. (I used homemade almond milk). Mix all ingredients together while heating it on stove. Sip and Enjoy! Some may choose to include some pepper as well – if you like the spice!